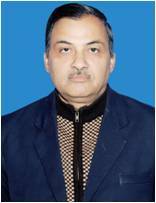 Dr. Pandey graduated from the University of Allahabad and completed his Master’s degree in Botany in the year 1975. Before joining Central Silk Board in the year 1981, he completed his Ph. D. in Botany from the Banaras Hindu University in 1980. Currently he is a senior scientist at Regional Sericultural Research Station Miransahib,Jammu , INDIA. Stem Cuttings of eight new Morus alba varieties as shown in Table I, evolved by different Research Institutes, were planted in the last week of December under Randomised Block Design with six replications/variety at Regional Sericultural Research Station, Miransahib, Jammu in freshly prepared nursery containing well dried pulverized garden soil and well decomposed farm yard manure and maintained with consistent care (Jolly and Dandin, 1986). The sprouting per cent was recorded 60 days after planting. A violent hailstorm hit Jammu on 27th February at about 7: PM in which volleys of ice balls continued for about 18 minutes. The white stones of ice with their size ranging from two to three centimeters suddenly started hitting and considerably stripped off the young newly sprouted mulberry leaves. 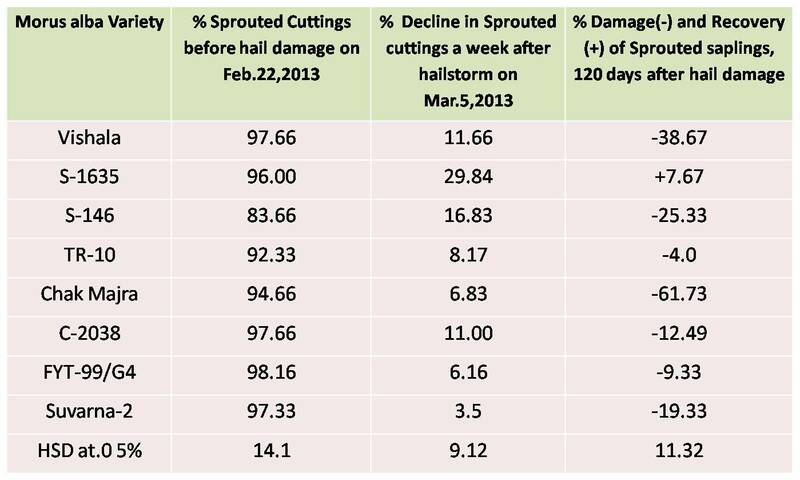 The effect of hailstorm on young sprouted leaves was assessed on 5th March, 2013, nearly a week after the hailstorm. The loss due to hailstorm was again calculated after 120 days to give sufficient time for recovery to the hail damaged saplings and record recovery, if any. 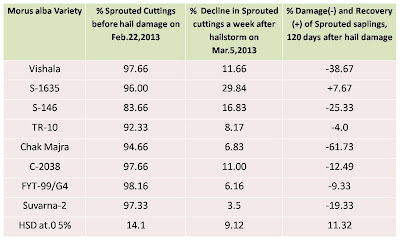 The loss of sprouted saplings due to hailstorm was calculated, by subtracting per cent sprouted saplings after hailstorm from per cent sprouted saplings before hailstorm. The data collected was subjected to statistical analysis by adopting methods of analysis of variance appropriate to the design of the experiment (Sundarraj et.al., 1972). Young newly sprouted mulberry leaves become shredded, pock marked or ripped by hail. Hailstorm damage can severely decimate the leaf harvest for silkworm rearing in spring season. An effort was made to assess the recovery after hail damage during February – March 2013 among eight Morus alba varieties at Regional Sericultural Research Station, Miransahib, Jammu. The damage was recorded as sprouting per cent after one week of the hailstorm and was compared with the sprouting % prior to hail damage. The recovery was assessed after 120 days of hail damage in terms of sprouting per cent. It was found that the hail damage was highest in S-1635 (29.84%), followed by S-146 (16.83), Vishala (11.66), C-2038 (11.00), TR-10 (8.17), Chak Mazra (6.83), FYT-99/G4 (6.16), and Suvarna-2 (3.5). However, it was only S-1635, which showed recovery of 7.67% after 120 days, while others showed further loss. Therefore, it is recommended to propagate Morus alba variety S-1635 at farmer’s level in sub tropical Jammu area. Ahanger M.R., Ramegowda G.K., Illahi,I., Rizvi G., Dhar A. and Sahaf K.A.2013. Reaction of Mulberry germplasm to frost damage in Kashmir. Res. J. of Agri. Sci. 4(2), 180-183. Dhar A. 2011. Mulberry sericulture in Jammu and Kashmir-An insight. Proc. workshop on Recent trends in development of bivoltine sericulture in Jammu and Kashmir. 29th October 2011, SKICC, Srinagar, Kashmir, pp7-13. Jolly M.S. and Dandin S.B. 1986. Collection, Conservation and evaluation of mulberry (Morus spp) germplasm. CSR&TI Mysore, India .43. Rajat Mohan, Tewary R., Dhar A., Singh S., Bhat M.M. and Khan M.A. 2010. Sericulture & Environment are complimentary: Plantation of improved mulberry genotypes at different altitudes of Himanchal Pradesh. The Bioscan, 1, 217-224. Sundarraj G.L., Nagaraju M.N., Venkataramu and Jaganath. 1972. Origin and analysis of field experiments. UAS, MISC .Series No.22, Bangalore, India, 424-440.